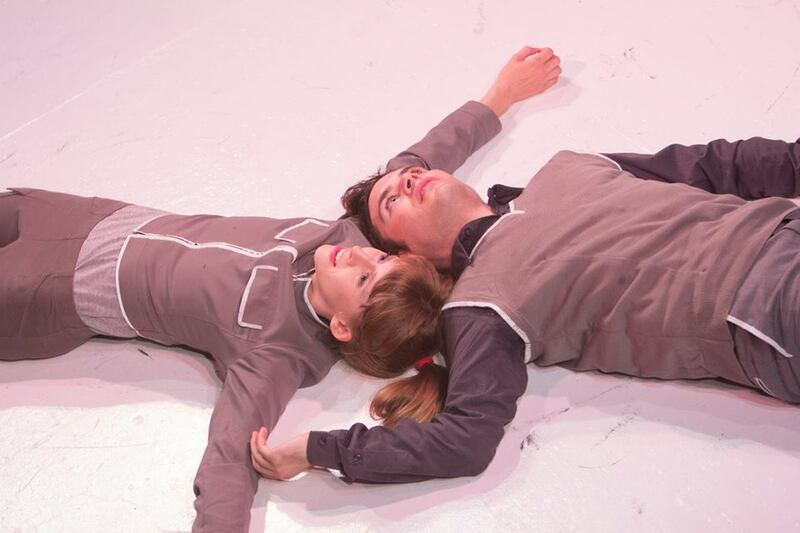 Photos courtesy of Pink Milk in a previous production. Much has been made of the life of Alan Turing and the positive contributions he made to the world of computer science—algorithm formalization, the invention of the Turing machine, his role in helping Nazi Germany fall—in the history books. He was a hero and an inspiration due to his achievements and should rightfully be remembered as such. Turing also happened to be a homosexual, a fact that now (luckily) likely doesn’t raise an eyebrow unless you’re living a sad sheltered life somewhere oppressed. This is fortunate for us, but rather unfortunate for the real life Turing. In fact, it’s downright tragic. That is because the mere existence of Turing’s homosexuality lead to his chemical castration and, ultimately, his death. Turing was not, as the previous sentence may suggest to those unaware of his story, the victim of a hate crime, or at least not a random hate crime. His castration was performed by the legal authorities of the British government. All this was done in spite of the accolades his country had bestowed upon him for his life work. That hypocrisy like this was allowed to take place in this last century should not be surprising to anyone with any knowledge of homosexual or queer history, nor should the willful omitting of these events from the popular history of Turing’s mythology. What is surprising though, is the spirited and creative rendering of Turning’s inner emotional life that Pink Milk illustrates for us in a play making its west coast premiere right here in Long Beach at The Garage Theatre. 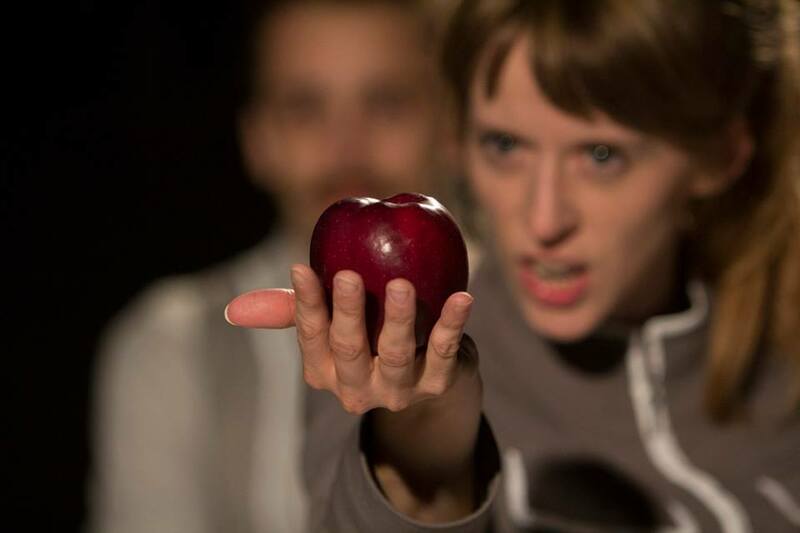 Pink Milk is a relatively new work, premiering a mere two years ago at the Chicago fringe festival and it makes for a bold and inspired choice for The Garage in collision with Alive Theatre’s 2014 season. 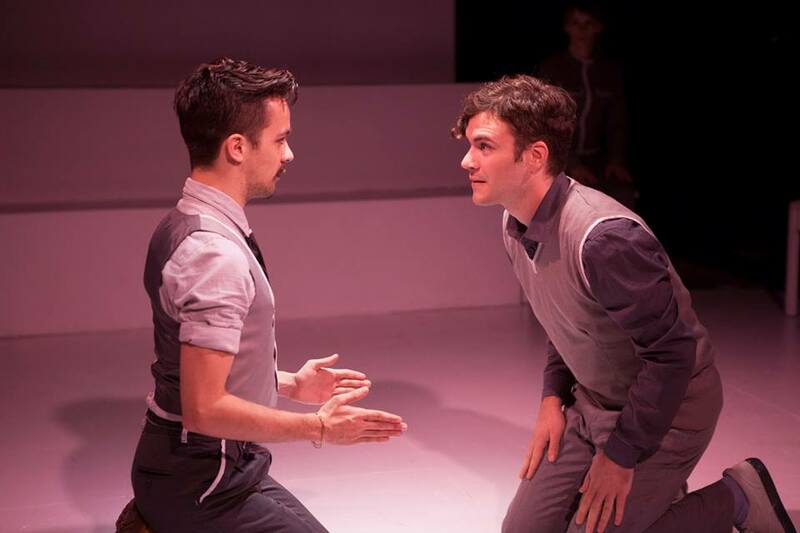 Pink Milk is not a perfect play, nor is this current production likely to be its definitive rendering, yet there is much to enjoy and take from both the play and this production of it. 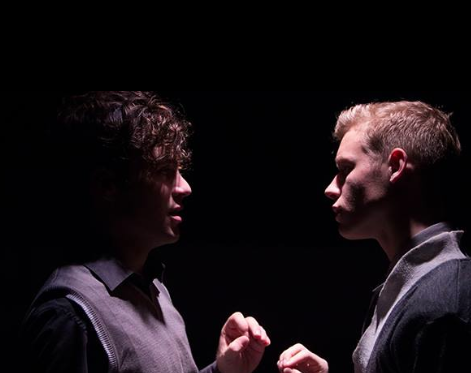 In this interpretation of Turing’s life, written by the young and talented Ariel Zetina (aka Alex Paul Young), Turing’s history is conceived and told through a series of dreamlike tableaus that incorporate music, movement and visual metaphor. 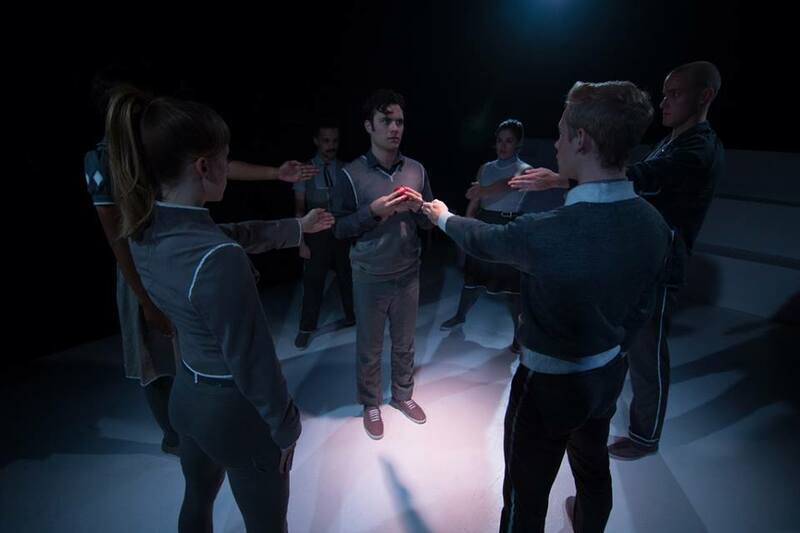 “If you think this is going to be a history lesson, you’ve come to the wrong place,” states Christopher Morcom at the play’s beginning, a character that serves as both a historically factual person in the Turing saga, as well as a role as the play’s meta narrator. His opening line could not be more applicable. For better and for worse, Pink Milk focuses on the emotional and metaphorical rather than on the factual and the pedantic. 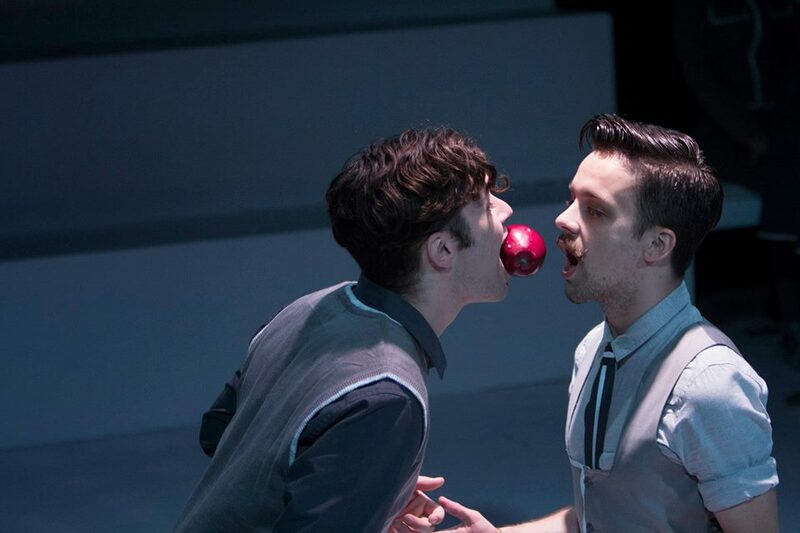 Structurally the play fluctuates between episodic narrative and abstracted, poetic ruminations on the events that are known about Turing’s life. 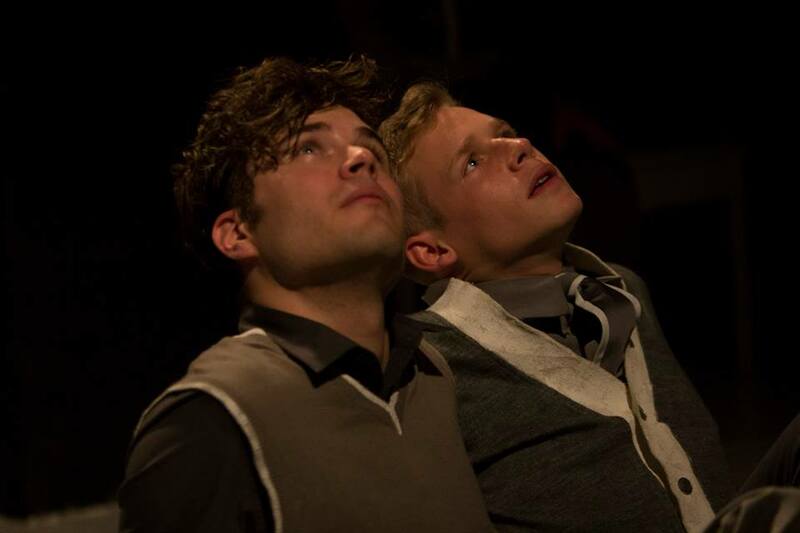 The dreamlike structure of the play does his spirit long-overdue justice, but it can sometimes make it hard to tie the emotionally applicable happenings presented here to Turing’s actual historical past. While I appreciate the relentless insistence to celebrate the aspects of Turing’s life that history has so unjustly denied, the play is at its most far reaching when it dwells in its ethereal spirit rather than its cruel reality. That is, until the ending when the play’s insistent metaphors collide with its historical events in a beautiful and well-earned crescendo. The Garage’s production of Pink Milk does its source material great justice but doesn’t soften out the play’s mild unevennesses. This is to say that when it dwells willfully in metaphor and poetics it soars, and it feels clunkiest when dealing with reality. The production is emotionally resonant, willfully alternative and playfully DIY as are all of the best offerings from this company and its rewards are plentiful. Under the skillful direction of Ashley Elizabeth Allen, the material is given the energy and creativity it requires to resonate, but it’s a great cast that really makes the material take off. There is not a weak link to be found here, a surprising case considering that many of the cast members double up as multiple characters over the course of their performances. Lottie Frick is one of the most surprising, giving life to the intimate objects that inhabit the play. The cruel tenaciousness of poisoned milk and the fairy-like, hippy-dom of a daisy in a field are each, through her performance, brought to vivid life. As Alan’s father and his downfall-inducing lover, Craig Johnson finds a great deal of nuance and passion in his turn as two characters that are as integral to Turing’s life as they are psychologically provocative in their dual casting. He inhabits both with dedication and grace. As both Christopher and Alan’s mothers, Blair Allison lends a tender and much needed female presence to a story whose characters’ lives suffer from a lack of acceptance of the inherently feminine. Lysander Xanthus plays the appropriately androgynous narrator and childhood lover to Alan’s tale with a detached and delicate other worldly air. Nick Rapp’s Alen totally steals the show however, and I feel no shame in saying it. He portrays Alen with an inspired and touching mix of naiveté and wonder that make his character as heartbreaking and believable as one could hope. So often when people play children they come off as pandering, but Rapp’s incessant wide-eyed personality grows and shifts along with Alen’s, leading us to discover the truly humane being at his core. Alen’s earnestness in other hands could easily have come across as goofy or in-genuine, but here Rapp takes his character seriously and in doing so allows us to do the same. Sound and music by Matari2600 is almost always the right choice at the right time and the simple but thought provoking set by Yuri Okahana creates a wonderful theatrical playground of varying perspectives for director Ashley Elizabeth Allen’s creative if sometimes overtly showy staging. While there is much more to celebrate than scold in this play and this current production of it, it is not without its faults. In choosing to so unflinchingly focus on Alen’s inner life rather than his public one, the material can sometimes feel at odds with the reality of Turing’s history and this production can as well. Coming into the Garage without much knowledge of who the real life Turing was, what war he helped in ending, and the era in which he was building computers and robots was slightly alienating to me and in the long run did more to confuse than engage. While the dream-like quality of the play is essential to its success and its relevance, I wish that the material and most importantly in this scenario, this production, took at least one moment to drop us into an unquestionable time and place. This is not to say that I wanted to see Nazi armbands sported all of a sudden but I would have liked to have had an instant of the play where I was aware of exactly when in time we were. While most of us are aware that Snow White was released in the late 1930s, an earlier signifier would have been helpful. Regardless of its minor shortcomings, Pink Milk is an important and moving new work. In a town as diverse and queer/gay friendly as our own it is important to remember that times were not always as accepting as these, nor are all places as progressive or welcoming. At the end of the day, Pink Milk is a necessary testament of injustice and of transcendent love that deserves to be heard and seen. 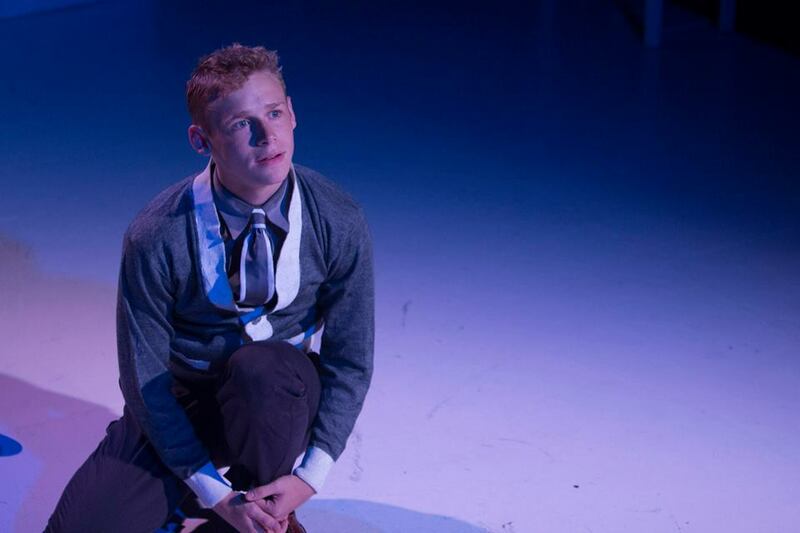 “Take risks in here but not out there” Alan’s mother warns him very early on in the play. 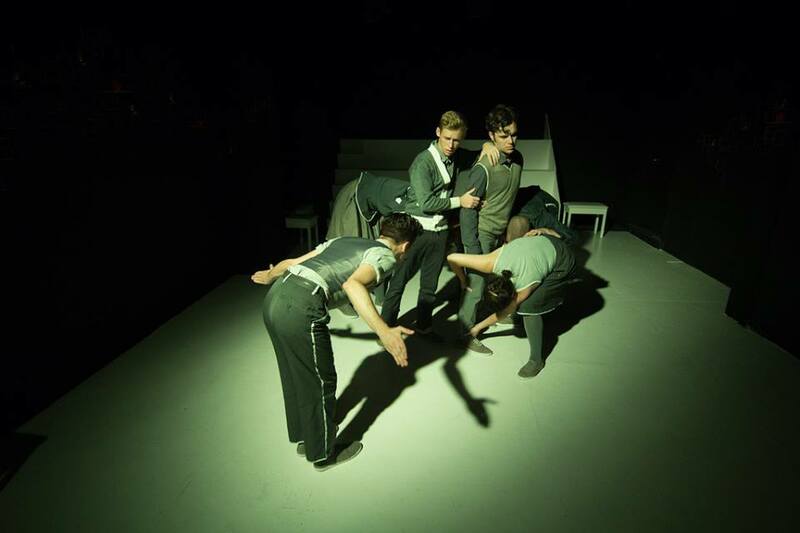 The Garage in collision with Alive Theatres do indeed take risks here, yet they are bold enough to suggest we attempt to move towards creating a world that does not need to take Mrs. Turing’s advice to heart.